An employment notification with name in the form of UPBEB recruitment has been distributed by the Uttar Pradesh Basic Education Board. The skilled and qualified Indian citizens can apply for deposits of 69,000 posts of Assistant Teacher till the last date of December 22, 2018. Job seekers who wish to apply for the opening of this job in UPBEB jobs and get the remaining information about UPBEB recruitment 2018 through this page provided by the team of www.telanganaa.in . Eligibility: Candidates must have completed graduation degree / DLEd / D.Ed. / NCTE / BL.Ed / BEd / UPTET / CTET examination or equivalent with good marks from recognized University / Institute. Interested candidates belonging to SC / ST category will get Rs. 400 / - in the form of application fee. Candidates should be between 21 and 40 years on 01-07-2018. How to fill out the UPBEB application form? To open the official site of http://www.upbasiceduboard.gov.in, you must first open all the applications. A list of this latest opening link will open and the candidates will have to choose the most appropriate link, which will open the entire ad with information about the UPBEB vacancies. Online registration of the application begins: 06-12-2018. Dead line to submit online application is: 22-12-2018. Click UPBEB Recruitment Notification here. 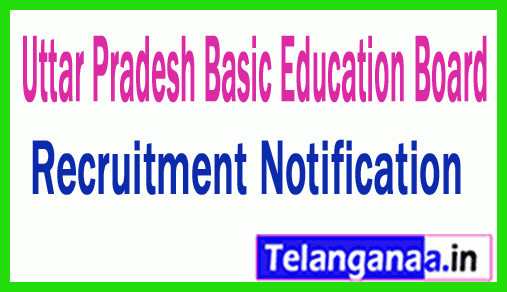 Click UPBEB Recruitment Notification here 2. Uttar Pradesh Basic Education Board (UPBEB), government of Uttar Pradesh invites online application for the post of Uttar Pradesh State Teacher Aptitude Test (UPTET) 2016 to select teachers for the classes IV (primary), classes VI-VIII (elementary level). Apply online before October 24, 2016. For grades IV (Primary level): Candidates should have degrees from UGC University with 02 years of BTC (Final Year & Passed out Candidates) recognized / NCTE / 02 years Diploma (D.Ed.) from the Indian Rehabilitation Center (RCI) / Intermediate with at least 50% of the marks / its equivalent with 04 year degree (Graduation & Passed out Candidates) in Bachelor of Elementary Education (B.El.Ed). For the classes VI-VIII (upper primary): The candidates are to have degree of UGC recognized university / 02 years B.T.C. (Final year & Passed out Candidates) of NCTE / Intermediate with at least 50% of the marks / their equivalent & 04 degree (graduation year and candidates passed) in Bachelor of Elementary Education (B.El.Ed), intermediate or equivalent BA / B.Sc.Ed or baed / B.Sc.Ed recognized by NCTE / UG or completed in relevant discipline and B.Ed. Selection process: The selection will be based on written exam consists of paper I & PAPER II. Application Fee: The candidates must pay Rs. 400 / - (paper I or II only) for General / OBC candidates, Rs. 200 / - (paper I or II only) for SC / ST candidates. No charge for physically challenged candidates. How to apply: Interested and entitled candidates are required to apply online through the website upbasiceduboard.gov.in from 05.10.2016 to 24.10.2016.